I was downstairs doing dishes and, while I was paying attention, she had a rawhide bone and laying nicely on the floor. Next time I look around she was nowhere to be found. Now that is one of the cutest pictures I have seen all week. Look at those perfect ears! Tala looks very wise for her young age. What a sweet heart she is going to be for you. I wish you nothing but good luck, a long life, good health, sweet temperament and an un-ending love at all times for her momma. Good luck with your fuzzy little baby - she's definitely a keeper. Look at that baby! Just precious and those big ears - straight up I love those big ears! 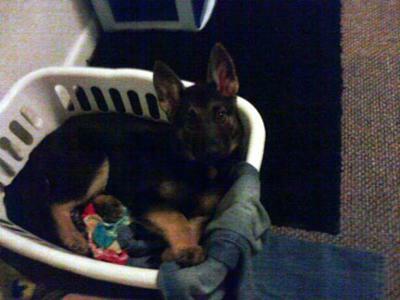 Brings back memories for me, when Mia my GSD now 2 yrs old was at that age. I love the puppy years (the first 2 years) even though its hard work, teaching and training but it's worth it. You can our story, GSD puppy Mia's story and Mia My Beautiful German Shepherd Dog. Tala is going to be "something" else, I can tell, you will so much fun with her and she will be you protector. Take care of your girl and she will take of you!